We've been very busy this week getting the Shop in somewhat order & the Gallery ready for quilts. We have also busy with our customers. We would like to thank everyone who has stopped to visit the new Shop this week. We truly appreciate your business. The Gallery is now open. 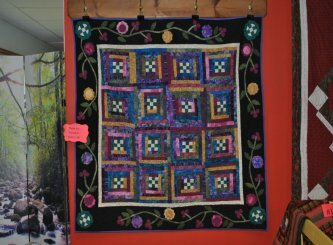 If you would like to display your wall hanging or quilt in our gallery, you are more than welcome to share with others. We set this room aside so that quilters could share their wonderful creations with others. We will use only your first name & initial of your last name, unless you let us know we may use your full name. We wish to respect your privacy. We also put your Town & State on the placard. We have a our first customer display up in the Gallery. It is a creation of Donna D. of Sayre, PA. It has absolutely beautiful applique work on the border. Here colors are vibrant & she used batiks in her squares. Feel free to stop in & see this beautiful quilt in person. The photo doesn't do it justice! Keep Calm & Quilt On.